The history of the Stangl and Fulper potteries is an interesting one, starting with the purchase of some land in Flemington, New Jersey in the summer of 1814, and the opening early the next year of Samuel Hill’s Earthen Ware Manufactory, as he then called it. Upon Hill’s death, control of the pottery eventually devolved to Abraham Fulper, one of his potters. By 1864, the name of the pottery had changed to Fulper Pottery, then Fulper & Son, by 1890 Fulper Bros. & Co., and finally upon incorporation in 1899, the Fulper Pottery Company. Martin Stangl was hired in 1910 as chief ceramist. Stangl left for a brief stint at Haeger Pottery in Dundee, Illinois in 1914, returning to Fulper in 1918. 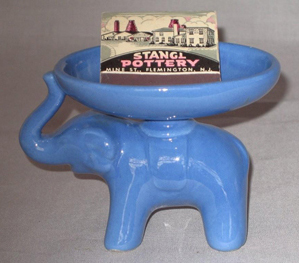 Stangl eventually became vice-president in 1924, then president in 1926, but never officially changed the name of the pottery until 1955, when the Fulper Pottery Company became the Stangl Pottery Company. In 1926, Stangl started producing dinnerware in Trenton at the former Anchor Pottery on New York Avenue, and by 1935 all production had moved to Trenton. The Fulper/Stangl exhibit is housed in two galleries on the second floor in Ellarslie Mansion preceded by a display from the Hill Pottery works. Samuel Hill never signed his work, so attribution is generally difficult, but not so in this case. On display are shards of pottery recovered in 2006 during the reconstruction of the historic Hunterdon County Courthouse in Flemington. Work on the courthouse landing was halted when pottery sherds, traced to Hill’s pottery, were found buried in the concrete. 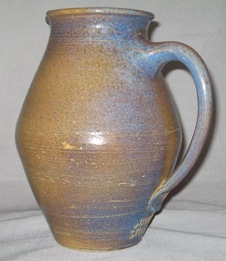 One gallery is devoted to the various works of Fulper, starting with its stoneware, featuring crocks and jugs, and then progressing to Fulper’s introductory Vase-Kraft line. There are also pieces from Fulper’s early and later periods, and even an exhibit of Fulper’s extremely rare carnival ware, available for only a few days in August 1909. The other gallery features a comprehensive display of some of Stangl’s most interesting, beautiful, and little-seen work, including the very first line of Stangl, given the name brand Fulper Fayence, introduced in 1924. Additional exhibits examine a line introduced in 1926 called Fulper-Stangl, and another is devoted to Stangl’s handmade art ware, introduced in 1927. Other exhibits feature Stangl Stoneware thrown by James Teague, produced for two years in 1940 and 1941, and another features the hand thrown work of Anne Fritsche Martin, who produced stoneware for Stangl during the summer of 1965. Many pieces of Stangl manufactured in Trenton, including early art ware, dinnerware, and dinnerware samples never put into production are also on display. Curating the exhibition is Peter Meissner, of Three Bridges, New Jersey, the leading authority on the early art ware of Stangl. Over the years, he has served variously as vice-president and president of the Stangl/Fulper Collectors Club headquartered in Flemington, and has written numerous articles about Stangl for the club’s publication and others. He has given a number of talks about Stangl in the past, and will give a lecture and tour of the exhibit at Ellarslie Mansion on January 10, 2010 at 2 p.m. He also will be a featured speaker at a symposium to be given in the auditorium of the New Jersey State Museum Saturday, April 17, 2010, sponsored by the State Museum, The Trenton City Museum, and the Potteries of Trenton Society.